Hey all you four legged animal lovers, you are going to want to stop by everyday this week! 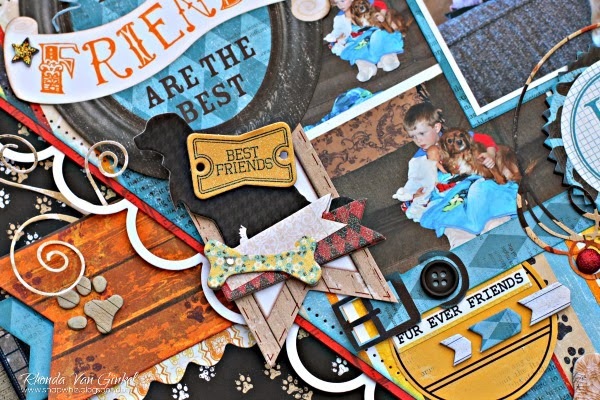 We will be featuring our Happy Tails collection in a varieties of ways! We recently adopted a 9 year old Golden Retriever and he immediately left paw prints on my heart. 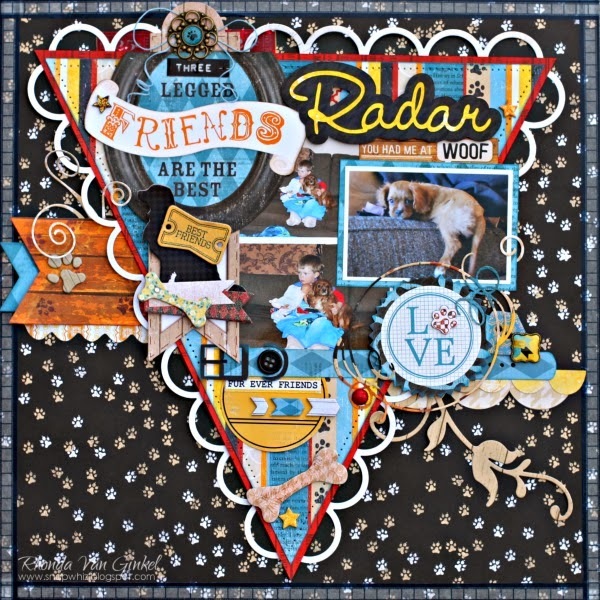 When I saw the Happy Tails collection, I felt that is was a match made in doggie heaven and I couldn't wait to create a scrapbook page using it. Designer Tip: The Misc Me Journal Cards aren't just for pocket page scrapping. I used a variety of them to mat and frame my photo and to layer and decorate with on my page. I cut all of them into 2 pieces and placed one on one side of the photo/page and the other half on the other side. Designer Tip: To add more dimension to your letter stickers, adhere them to you layout using double sided foam tape. Tape that is on a roll can be cut to the size you need. I was thrilled to get this collection so I could scrap our family dog, Radar. He is extra special, gentle and sweet. These photos of him capture his soft nature and I was so excited scrap them! You can see I've altered the title, he was born with three legs and is just a joy in every single way. I started my page by trimming the Stripes paper to a 10x10 and then decided maybe I wanted to try a different look, so I took the center point and then created a big triangle. I matted it and then collaged the fun embellishments in the line, adding a few die cuts of my own along the way. 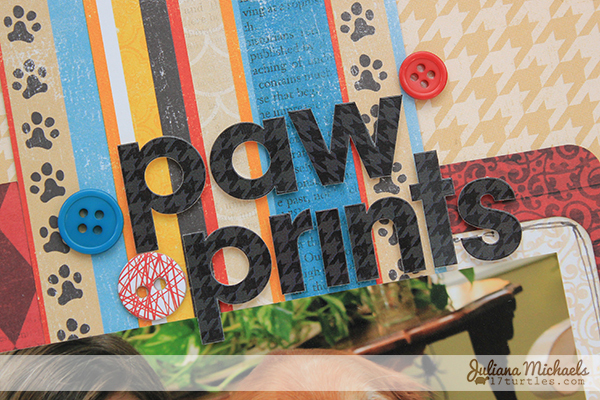 We can't wait to see you pet projects that you create featuring this amazing collection! Happy Tails is perfect for most every kind of furry creature! Such amazing pet lay-outs! I love them both to pieces! Wow... I loved these pages... Are beautiful! 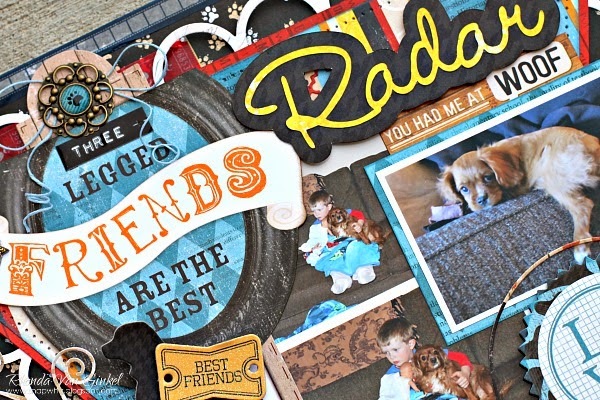 Love this collection and what a sweet layout Rhonda!!! Gorgeous layouts ladies! LOVE them both! You ladies did an amazing job with this collection. They are both furtastic!!! I really love this fun collection as like most people, our fur babies are a big part of our family! 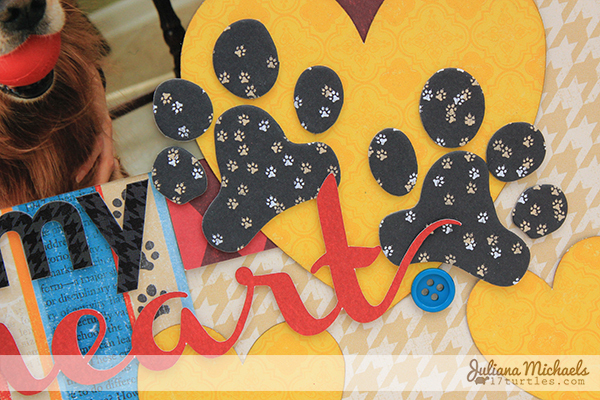 Juliana - I love the title work and your photo is so very sweet! These are just fabulous pages! Love them both! Awesome! Both layouts are just fabulous! Beautiful work! Great job Ladies! 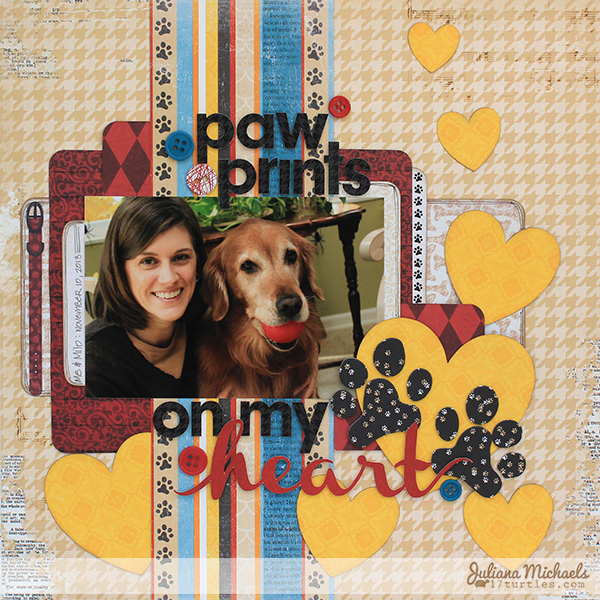 Love your happy tails layouts!